That’s a tough one. In response to this fair question I’ve do little more than shrug and say, “It’s complicated.” Now, instead of just shrugging, I’ve written down some of the East Bay Internet landscape intricacies in this series of blog posts. tl;dr: Internet availability is complicated because there are individual Internet stories for each neighborhood and niche in the Bay Area. To avoid all these details you can employ Telnexus as your telecom agent and we’ll figure out the best deal for you! All Internet Service Providers (ISP) in the East Bay deliver Internet Protocol service over these separate types of media which tend to dictate the performance and economics of the service delivered. In the spirit of the Gartner Magic Quadrant, Telnexus did an analysis of the East Bay Business Internet competitive landscape. We broke down the carrier products by the media types, and then we placed the media type in our quadrants along two dimensions of analysis. We compared monthly subscription prices with the speed and “quality” of the Internet service. The guarantees on 100% service delivery determines the Service Level Agreement rating for a service type. Services that have SLA’s are considered “better” than consumer-grade services. The cheapest and most common solutions are the big, consumer-grade DSL, ADSL and Cable networks. They now carry the bulk of the traffic because they are the most affordable. People are starting to gripe about the top speeds of ADSL and Cable, which is capping out at 250/20 Mbps for now. New Fiber-to-the-Premises (FTTP) deployments can easily hit 1 Gbps port speeds. The only problem is everything is months or years behind schedule. 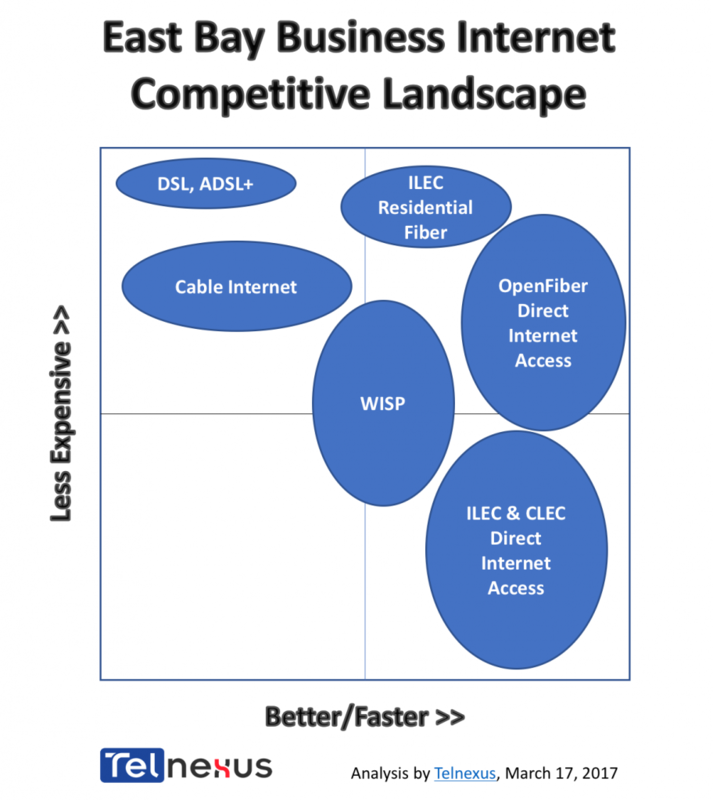 After glancing at our graph, you are probably wondering who sells this “OpenFiber” Direct Internet Access, since OpenFiber is sitting right in the middle of magic quadrant and the big winner in our analysis! OpenFiber is being built by Paxio, and they work with a select group of Bay Area partners, including Telnexus, to resell OpenFiber service. At Telnexus we deliver a finished product to the customer reselling OpenFiber internet access and our Cloud PBX telephony service. OpenFiber offers services that competes with AT&T’s Direct Internet Access options, which is AT&T’s highest tier of business services. OpenFiber is a carrier-agnostic fiber optic lightwave network being developed by Paxio in the Emeryville, Berkeley and Oakland business centers. Because Paxio is running their own fiber plant, they are considered a Tier 1 Competitive Local Exchange Carrier (CLEC). Paxio has done a great job to literally blow up the normal way that telecom services are being sold, resulting in dramatic savings for new OpenFiber customers. That is good news for companies in the Paxio footprint because they may now can replace an older AT&T $750 15 Mbps bonded T1 circuit with a $550 100 Mbps FTTP offering. The economics of moving to an OpenFiber provider is can be dramatic. The problem is that your address will only get one or two of these options. We are in a 5-year construction cycle for Internet speeds over 100Mbps to become common in every neighborhood in Berkeley, Oakland and Emeryville. Eventually everyone will benefit from more ISP competition and availability. Kudos and congratulations to Philip Clark as the driving force behind Paxio, OpenFiber. Philip has demonstrated the leadership and determination to need to get a monstrous project like OpenFiber in motion. Thanks, Phil!